REACH OUT 2014 - Meet your favourite YouTubers here! A cool platform to promote volunteerism to urban youth through sharing of experiences by selected champions of volunteerism who are successful in their own arenas. Register now to book your spot at the convention and win passes for the Meet & Greet Session! Reach Out Convention and Celebration is happening this 5th April 2014, 2pm-11pm, at Taylor’s University, Lakeside Campus. Entry is FREE! Share this with your friends and get them to register their names as well! 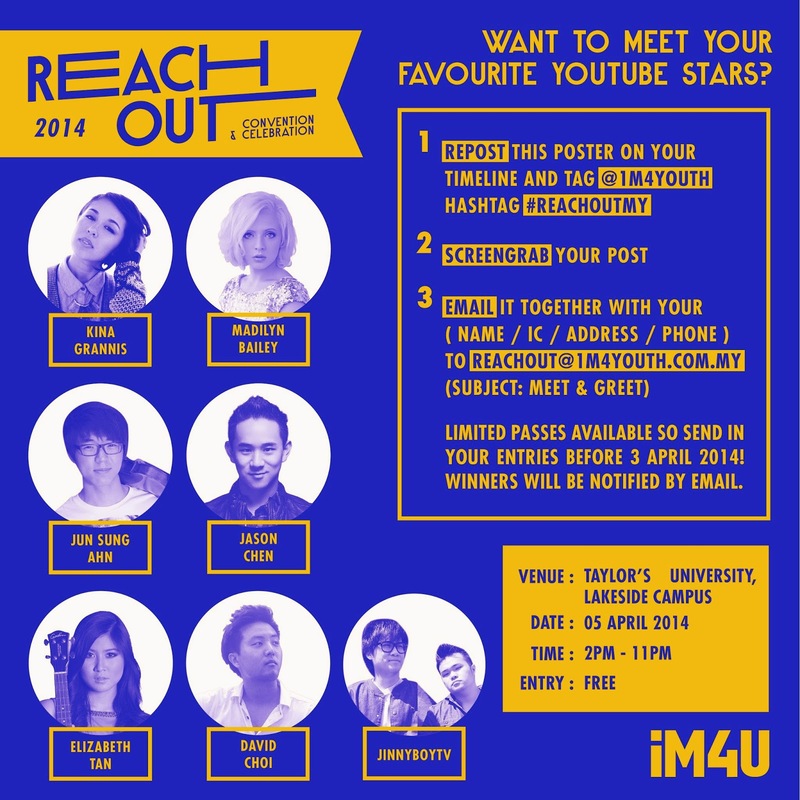 Wanna meet your favourite YouTubers at Reach Out 2014? Join now!! 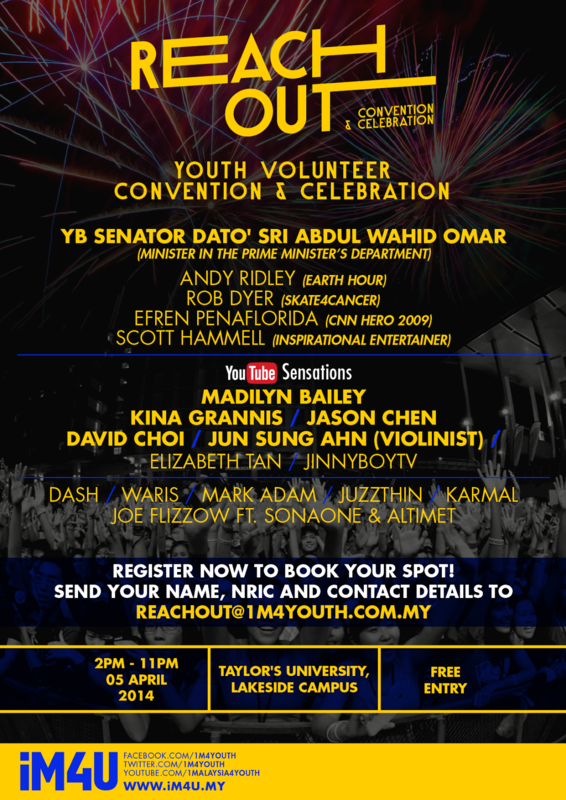 1Malaysia For Youth are giving away 200 passes for you to Meet and Greet YouTube Sensations Kina Grannis, Madilyn Bailey, Jason Chen, Jun Sung Ahn, David Choi, Elizabeth Tan and JinnyboyTV at Reach Out 2014! Limited passes available so send in your entries before 3 april 2014! Winners will be notified by email. TIME : 11.00 a.m. – 5.00 p.m. Calling for young people under 26 years old who like music, are quirky, fun and creative and have a social cause they feel strongly about. 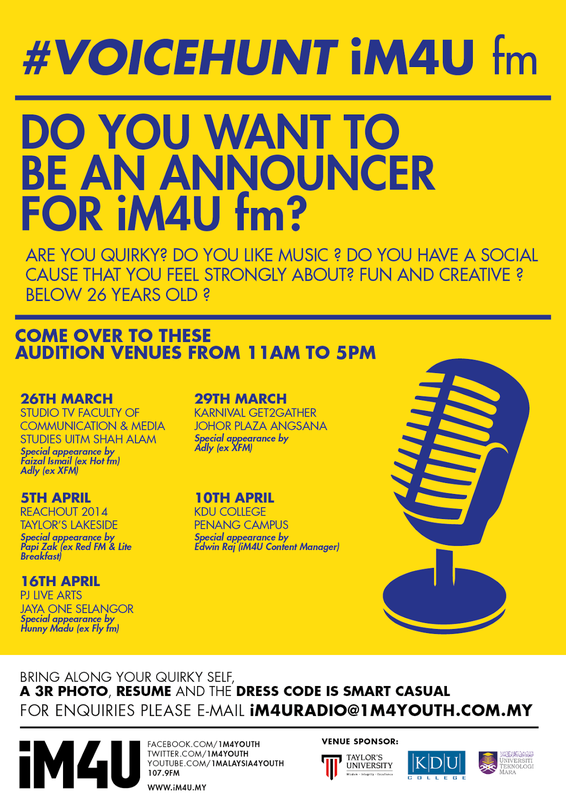 iM4U fm is looking for announcers and potential candidates are invite to audition – come armed with a 3R photo, and resume.